The aim was to compare clinical outcome and fate of solid cartilage versus diced cartilage in fascia in augmentation rhinoplasty. Augmentation rhinoplasty can be achieved through many different techniques and materials. There are many different implantable materials available, both autologous and nonautologous. The major limitation of nonautologous material is the limited biocompatibility, which contributes to allergic reaction, excursion, displacement, and infection. This study was conducted in combination of Plastic Surgery and Burn Department of Mansoura University and Plastic Surgery Department of Menoufia University during the period from December 2012 to November 2015. It included 14 patients who underwent augmentation rhinoplasty, aged from 18 to 35 years, with mean ± SD age of 25.7 ± 6 years. In total, five (35.7%) patients were female and nine (64.3%) patients were male. Patients were divided into two groups. Group I underwent augmentation rhinoplasty by solid cartilage graft (septal, conchal, or rib). It included seven patients, with five (71.5%) male and two (28.5%) female patients, with mean ± SD age of 24.5 ± 6 years. Group II underwent augmentation rhinoplasty by diced cartilage graft enveloped in fascia (deep temporal fascia). It included seven patients, with four (57%) male and three (43%) female patients, with mean ± SD age of 27 ± 5 years. A total of five (35.7%) patients were female and nine (64.3%) of them were male. Overall, six (42.8%) patients underwent primary rhinoplasty, six (42.8%) patients secondary rhinoplasty, and two (14.2%) tertiary rhinoplasty. In group I, 43% of the patients had satisfactory (excellent) results, 14.25% of patients had intermediate results, and 42.75% of patients had unsatisfactory results. In group II, 71.5% of patients had satisfactory (excellent) results, 14.25% had intermediate results, and 14.25% had unsatisfactory results. Diced cartilage graft is becoming a common place in rhinoplasty. The diced cartilage warped in autogenous fascia has good results, with minimal drawbacks, in comparison with solid cartilage. Rhinoplasty is one of the most common and difficult procedures in the field of esthetic plastic surgery . Ethnic influences can result in different appearances of the nose as follows: white as leptorrhine, African-American as platyrrhine, Hispanic as paraleptorrhine, and Asian as subplatyrrhine . The external valve is a variable area dependent on the size, shape, and strength of the lower lateral cartilage . Dorsal augmentation is the most commonly addressed issue in Asian rhinoplasty and also the most common cause for revision surgery. When performing augmentation rhinoplasty in Asians, dorsal augmentation is done using available implant material . The Hispanic nose has some similarities to other ethnic noses. Its morphology had been similar to the African-American nose: weak, wide, and flat cartilage, wide alar base usually combined with round nostrils, and low flat dorsum . Augmentation rhinoplasty depends mainly on how to employ autologous grafts or alloplastic implants to correct nasal skeleton defect and restore dorsal height. For dorsal augmentation, either autologous or alloplastic implants as a source are available. The choice of any material depends on the extent of the dorsal deficiency, the overlying skin–soft tissue envelope, characteristic of implants, its relative advantages and limitations, body response, history of prior surgery, associated structural deformities, preferences of the plastic surgeon, and views of the patient . Bone and cartilage as autologous source are employed for nasal dorsal augmentation. Although bone grafts are usually well tolerated, they tend to impart an unnatural, rigid-appearing structure to the reconstructed nose. Cartilage grafts have used for multiple applications in rhinoplasty such as spreader graft, alar contour restoring, lateral crural strut, tip &collumelar strut, septal extension, batten, and dorsal augmentation, which consumes more volume of cartilage . A large variety of alloplastic materials have been used for nasal dorsal reconstruction. Selecting the optimal material continues to be a challenge . There has been considerable interest in the role of diced cartilage grafts for nasal dorsal augmentation, but controversy exists as to the predictability of molding it into the desired shape and the long-term viability of the diced cartilage . 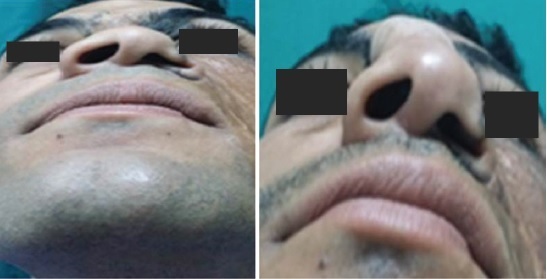 Rhinoplastic surgeons agree that alloplastic materials should be reserved for cases in which there is insufficient autologous tissue for grafting, also for patients who refuse donor-site morbidities, so the option for alloplasts on a broader in front . The aim of this study was to evaluate the clinical outcome and fate of solid cartilage versus diced cartilage warped in fascia in augmentation rhinoplasty (comparative study). 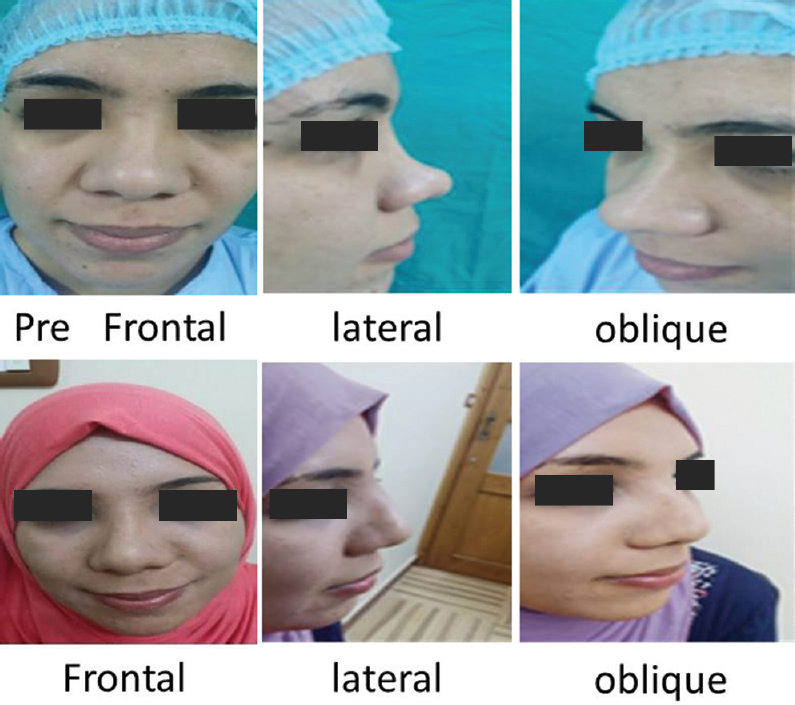 This study included 14 patients who underwent augmentation rhinoplasty in the plastic surgery departments of Mansourah University and Menoufia University from December 2012 to November 2015. Their age ranged from 18 to 35 years, with mean ± SD age of 25.7 ± 6 years. A total of five (35.7%) patients were female and nine (64.3%) patients were male. Moreover, two (15%) patients underwent closed technique and the other 12 (85%) patients underwent open rhinoplasty. Trauma was the main cause of saddle nose deformity, and the remaining cases were owing to other causes: congenital, iatrogenic, or inflammatory. The patients were included in the study after approval from the ethical committee. This study included all patients with good general conditions, fit for anesthesia and surgery. All patients requested for primary, secondary, or tertiary rhinoplasty with real expectation, and accepted for morbidities as scar or wound infection in donor site. Patients with psychiatric disturbance such as: body dysmorphic syndrome, those who had overexpectations, and patients with premorbid chronic illnesses as hypertension, diabetes mellitus, heart disease, liver dysfunction and renal affection, and bleeding tendency must be excluded. Patients were divided into two groups, and each group had seven patients. Group I underwent augmentation by solid cartilage graft (septal, conchal, or rib), and included seven patients, with five (71.5%) male and two (28.5%) female patients. Their mean ± SD age was 24.5 ± 6 years. 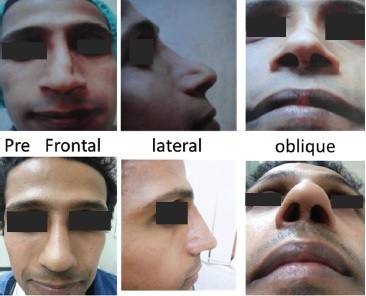 All patients underwent open rhinoplasty: three (42.8%) patients for primary rhinoplasty, three (42.8%) patients for secondary rhinoplasty, and one (14.2%) patient for tertiary rhinoplasty. For donor site of graft, three (42.8%) patients had graft harvested from costal cartilage and four (57.2%) patients had septal cartilage graft. The solid graft was inserted in pocket from the radix to supratip region for dorsal augmentation and was fixed in place by proline 4/0 to reduce postoperative migratory tendencies, also solid cartilage had been used for columellar strut and as a spreader graft. Group II underwent augmentation by diced cartilage graft enveloped in fascia (deep temporal fascia) and included seven patients: four (57.2%) male and three (42.8%) female patients. Their mean ± SD age was 27 ± 5 years. Overall, two (28.5%) patients underwent closed rhinoplasty and five (71.5%) patients underwent open rhinoplasty: three (42.8%) patients for primary rhinoplasty, three (42.8%) patients for secondary rhinoplasty, and one (14.2%) patient for tertiary rhinoplasty. For donor site of graft, four (57.2%) patients had graft harvested from costal cartilage, one (14.2%) patient had graft harvested from septum, and other two (28.5%) patients had graft harvested from conchal cartilage. The diced cartilage in fascia (DCF) was fixed in dorsum by stitches to keep in place and prevent displacement. After informed consent (including photos publication for research issues), patients were photographed and marked. All patients hadunderwent rhinoplasty procedures under general anesthesia with endotracheal intubation and in supinePosition with head had fixed on head ring. Infracartilagenous(rim)incision had been employed in closed rhinoplasty, with transcolumellar incision in open rhinoplasty with pocket dissection for cartilage graft insertion and fixation in pocket. Nasal dressing and nasal back had been fixed then nasalsplint for 2 weeks. Donor sites of grafts included septal, conchal, and costal cartilage. In group I, solid cartilage was used for dorsal augmentation as onlay graft, for spreader graft, for shield graft, or as columellar strut. In group II, diced cartilage grafts were prepared with a simple technique, as cartilages were diced into small pieces range from 0.5 to 1.0 mm cubes with blade size 11. The diced cartilage was packed into a cartilage injector and injected in a fascial tube. The deep temporal fascia was harvested [Figure 1], and tube creation was done by suturing fascia with 4-0 monocryle around the cartilage injector with blinded ended tube [Figure 2]. Diced cartilage was injected inside closed-ended fascia and then closed as a bag of worm [Figure 3]. Figure 1: Deep temporal fascia. Figure 2: Warped fascia around cartilage injector. Figure 3: Diced cartilage in fascia. Patient's follow-up was done over a period of 6 months through patient satisfaction score. A systematic score for degree of satisfaction (0–5) was operated as follows: 0 when patient stated unsatisfied, 1–3 when patient stated intermediate, and 4–5 when patient stated excellent. Postoperative photography was done in lateral, oblique, and frontal views. Postoperative evaluation included nasal warping, graft resorption with loss of nasal height, and nasal tip rotation. Any complications were documented as early and late postoperatively. A total of 14 patients underwent augmentation rhinoplasty, and they were divided into two groups. In the first group, the solid cartilage was used, whereas in the second group, the DCF was used. 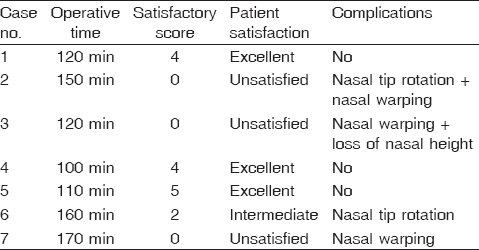 The clinical outcome and patients satisfaction score of group I are shown in [Table 1], and for group II are shown in [Table 2]. In group I, of seven patients, three (43%) patients had satisfied (excellent) results, one (14.25%) patient had intermediate result, and three (42.75%) patients had unsatisfied results according to systematic score. In group II, of seven patients, five (71.5%) patients had satisfied (excellent) results, one (14.25%) patient had intermediate results, and one (14.25%) patient had unsatisfied results. Nasal tip rotation, nasal warping, and loss of nasal height are complications observed mainly in group I. Otherwise, no complications such as infections, hematoma, excursion, tip necrosis were registered. In group I, three (43%) patients had postoperative nasal warping, one (14.2%) patient had solid graft resorption, and two (28.6%) patients had nasal tip rotation. One patient had graft resorption and nasal tip rotation; another patient had nasal warping and nasal tip rotation. In group II, only one (14.2%) patient had postoperative nasal tip rotation and one (14.2%) patient had nasal height loss [Table 3] and [Table 4]. In group I, all satisfied patients (three patients) had primary rhinoplasty session with open technique and cartilage graft from septum. However, in group II, the satisfied patients (five patients) had primary or secondary rhinoplasty session with any technique used open or closed technique with no difference in graft source despite the costal cartilage source provided a robust cartilage graft for dicing and overcorrection of dorsal defect [Table 5], [Table 6], [Table 7]. No significant difference was revealed in both groups regarding operative time. Our results of group II (DCF) were better than group I (solid cartilage graft). Cases presentation: a signed consent from patient was obtained for photographs publication. Group I: augmentation by solid cartilage graft (septal, conchal, or rib). Case 1 was a with saddle nose. Primaryrhinoplasty had been done using solid septal cartilage for dorsal augmentation and tip definition with columellar strut [Figure 4]. Figure 4: Case 1 (a) preoperative pictures and (b) postoperative pictures. Different nasal views pre and post. Case 2 was a male patient with history of nasal trauma, and secondary rhinoplasty was done for tip support with columellar strut with solid costal cartilage. After 6 months, there is tip rotation and cartilage warping [Figure 5]. Figure 5: Nasal tip rotation postoperatively in case 2. Basal nasal view pre and post. Group II: augmentation by diced cartilage graft enveloped in fascia. Case 3 was a patient with history of severe infective chondroitis of the septum leading to saddle nose. DCF for dorsum augmentation was done by conical cartilage graft and temporal fascia [Figure 6]. Figure 6: Case 3 (a) preoperative pictures and (b) postoperative pictures. Different nasal views pre and post. 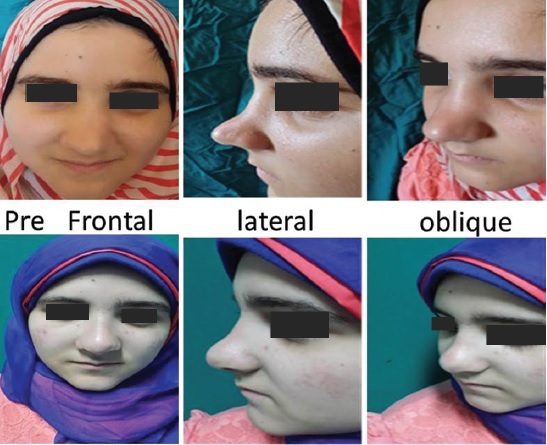 Case 4 patient with history of over hupectomyrhinoplasty, A augmentation had been done by nasalimplant then tertiary augmentation rhinoplasty done with DCF [Figure 7]. Figure 7: Case 4 (a) preoperative pictures and (b) postoperative pictures. different nasal views pre and post. Augmentation rhinoplasty to correct nasal deformity is one of the most requested procedures. It requires implants for augmentation which are either from natural sources, such as cartilage, bone, or dermal graft, or synthetic sources, such as silicone implants, medpore, and others. Cartilage graft is widely introduced as a tool to augment low nasal dorsum, correct irregularities, and defects of nasal dorsum or even in any nasal defect plus creation of a smooth texture after cosmetic or reconstructive rhinoplasty. 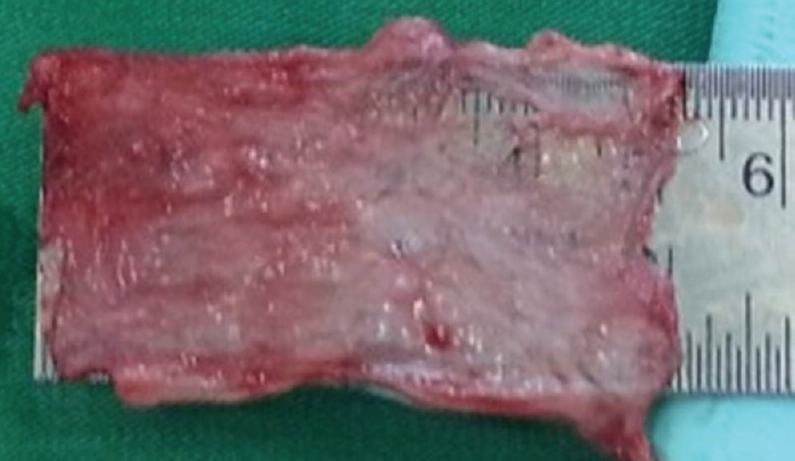 In cases requiring large and burst amount of cartilage graft, surgeons plan to harvest rib cartilage. However, solid costal graft has adverse effects such as warping, visibility, cartilage extrusion, and complications of donor site, so they employ diced cartilage graft. It has many advantages compared with the use of all cartilages pieces harvested from septum or ear during rhinoplasty with no adverse effects as solid cartilage . The concept of dicing of cartilage inside envelope 'Turkish Delight', began in 2000 by Erol where diced cartilage wrapped in surgicel was used for augmentation rhinoplasty. He described his technique by dicing cartilage and warped it inside Surgicel in more than 2000 rhinoplasty cases, with good outcome over long-term follow-up . The problem had been faced with the Erol'stechnique revealed that all cases had been complete graftresorption after 3 months of insertion and follow up with failure to correct the problem, which had led to rejection of Erol'stechnique. So Daniel and Calvert introduced another source ofenvelopes as temporalis fascia . In 2004, Daniel and Calvert had been reported disappointed results when using diced cartilage warped in surgical; these results had been included graft resopition occurred in all patients after augmentation rhinoplasty by diced cartilage insidesurgicel envelope. So they shifted to autologous temporal fascia as envelope for diced cartilage grafts, and they had better results. In histological analysis, diced cartilage in surgicel was biologically inactive whoever in opposite side dicedcartilage in autologous temporal fascia had high power of regeneration and biologically active . Owing to its advantages such as great flexibility, minimal warping risk, and no need for donor site to provide a long and straight cartilage graft, the dicing of cartilage has an attractive and great concept rather than a solid cartilage. So Tabbal and Tepper  focused on different outcome of different techniques for nasal augmentation of many etiologies. In 2014, Singh et al. performed 32 cases of primary rhinoplasties for dorsal defect. There were different etiologies such as trauma, congenital deficiency, and septal abscess. Diced cartilage graft in temporal fascia was done with graft harvested from nasal septum and ear concha after 1-year follow-up. Only one (4%) case had constriction of dorsum, but the patient was still quite satisfied with the outcome and did not want revision surgery. Singh et al. reported great cosmetic results for all patients in subjective and objective outcome. Regarding the results of our clinical study, among group I patients who underwent solid cartilage, there were 57% of patients who presented with unsatisfied results such as nasal warping (43%), graft resorption (14.2%), and nasal tip rotation (28.6%). However, the results of group II patients who underwent diced cartilage warped in fascia state that 14.25% of patients presented with unsatisfactory results and 14.25 of patients presented with intermediate results such as nasal tip rotation (14.2%) and nasal height loss (14.2%) after 6 months of follow-up. In this clinical study, good results were obtained using diced cartilage enveloped in autogenous temporal fascia, with low complication rate and good patient satisfaction. Our results were similar to the results of other clinical reports in DCF. Our explanation for this outcome is that the autogenous fascia may act as a perichondrium that promotes neovascularization, prevents inflammatory reactions, prevents resorption of graft, and maintains the overall regenerative potential of cartilage. In our cases, we harvested deep temporal fascia, and after 6 months of follow-up, we did not have any donor side morbidity such as scar or hair loss. Moreover, we only had two patients who required costal cartilage graft warped in fascia. Disadvantage of diced cartilage graft is that it does not give structural support, and it cannot be used where large amount of augmentation is required. In terms of long-term viability, we found that it undergoes minimal resorption, which is not clinically significant. Diced cartilage is probably the best of fillers available to camouflage various forms of nasal defects like that at radix, half length, full length, infralobule, or lateral nasal wall. Ease of insertion and malleability is a big advantage with use of diced cartilage. Moreover, overcorrections and undercorrections are predictable as the graft remains mobile for almost 2 weeks. Therefore, we conclude that with limitations DCF is an attractive option for use in rhinoplasties for those who require augmentation procedures. Its use should be encouraged till we find any substantial evidence against it. Adapting to a new technique always has its opponents, but only those who counter them emerge as winners. Disadvantage of diced cartilage graft is that it does not give structural support, and it cannot be used where large amount of augmentation is required. In terms of long-term viability, we found that it undergoes minimal resorption which is not clinically significant. Diced cartilage graft is open discussion for more clinical and experimental study and more modification and assessment. Hackney FL, Joseph M. Gryskiewicz: dorsal augmentation seminer. Plast Surg 2008; 22:63–64. Jones ME, Westreich RW, Lawson W. Augmentation of nasal tip projection using the inferior turbinate: review of technique and evaluation of long-term success. Arch Facial Plast Surg 2008; 10:34–47. Karaaltin MV, Orhan KS, Demirel T. Fascia lata graft for nasal dorsal contouring in rhinoplasty. J Plast Reconstr Aesthet Surg 2009; 62:1255–1260. McCurdy JA. The Asian nose: augmentation rhinoplasty with L-shaped silicone implants. Facial Plast Surg 2002; 18:245–252. Guyuron B, Behmand RA. Nasal tip sutures part II: the interplays. Plast Reconstr Surg 2003; 112:1130–1145; discussion 1146–1149. Dresner HS, Hilger PA. Dorsal augmentation. Semin Plast Surg 2008; 22:65–73. Lovice DB, Mingrone MD, Toriumi DM. Rhinoplasty and septoplasty. Grafts and implants in rhinoplasty and nasal reconstruction. Otolaryngol Clin North Am 1999; 32:113–141. Adamson PA. Grafts in rhinoplasty. Arch Otolaryngol Head Neck Surg 2000; 126:561–562. Erol OO. The Turkish delight: a pliable graft for rhinoplasty. Plast Reconstr Surg 2000; 105:2229–2241. Jack PG, Cochran CS, Vincent PM. Dorsal augmentation. Semin Plast Surg 2008; 22:74–89. Kim HK, Chu LS, Kim JW, Park B, HuiBae T, Kim WS. The viability of diced cartilage grafts wrapped in autogenous fascia and AlloDerm in a rabbit model. J Plast Reconstr Aesthet Surg 2011; 193:200–209. Calvert JW, Brenner K, DaCosta-Iyer M, Evans GD, Daniel RK. Histological analysis of human diced cartilage grafts. Plast Reconstr Surg 2006; 118:230–237. Daniel RK, Calvert JW. Diced cartilage grafts in rhinoplasty surgery. Plast Reconstr Surg 2004; 113:2156–2171. Tabbal N, Tepper OM. Diced cartilage versus solid grafts in rhinoplasty. Aesth Plast Surg 2011; 35:580–581. Singh SK, Sood T, Sabarigirish K, Ramakrishnan N, Rajguru R, Manoj Kumar K. A new era of diced cartilage rhinoplasty: our experience. Indian J Otolaryngol Head Neck Surg 2015; 67:338–340.